Welcome to hydeist: an angel's tale, a shrine dedicated to Hideto "HYDE" Takarai from a well-known Japanese rock band; L`Arc~en~ciel. Currently, you are hydeist's visitor, accompanied with . While some of the contents are still unavailable or under heavy construction due to countless revamps that I've been doing for the past 11 years, you can and will be able to lurk or browse majority of the completed infomation. The multimedia section holds a small gallery at the moment and will soon be filled with wonderful photos. Please enjoy your stay! Major Facelift + Gallery Upgrade! 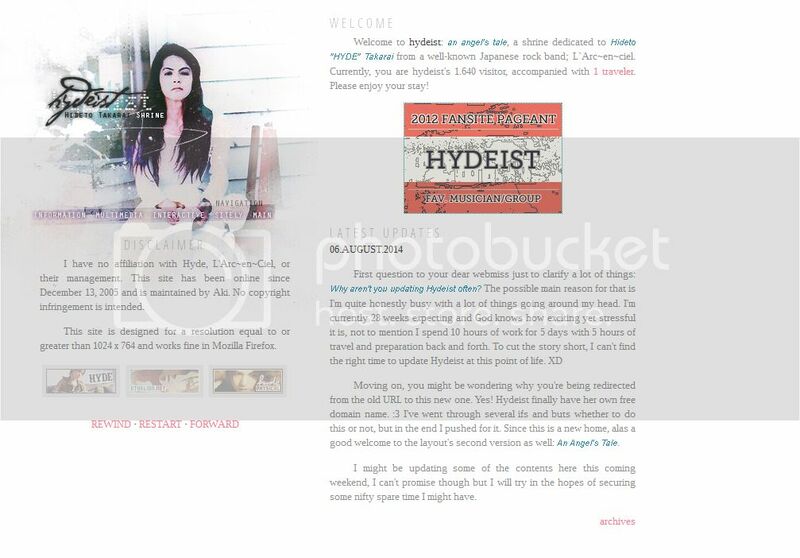 So, for the last 11 years and a half, I could say that this is the first time that Hydeist had a decent and professional looking layout (although the last two layouts are decent as well). And blimey! Hydeist has been running for that long with not much of an update and some under construction pages (LMAO). Included in the major facelift is the upgrading of the gallery section. Since Hydeist has been founded, I’ve been managing the gallery section with manual scripting. If I’m going to hold a big collection of the gallery, I’ll be needing a gallery script, right? At first I’m thinking about using Coppermine, but kind of hesitated because the script is a huge file. So I ended up using Plogger, which I think is a lot more easier and simple. :cute: Besides, it’s under the recommended list of my host’s Softaculous scripts. — This post was published on Wednesday, 15th February 2017 at 08:50 AM by Aki and was filed under Gallery, News, Site. Done changing the watermarks for the 2009 Live in Paris screencaps and added the Season’s Call PV screencaps. — This post was published on Sunday, 10th August 2014 at 19:21 PM by Aki and was filed under Gallery, Site. As I’ve mentioned yesterday, I was supposed to do the updates this coming weekend. Turned out that the said spare time came way too early. XD Anyway, the Link PV under the screencaps section is now up, with a total of 23 pictures. — This post was published on Thursday, 7th August 2014 at 11:47 AM by Aki and was filed under Gallery. + Be respectful at all times. Hydeist.tk is an unofficial fansite dedicated to the singer and song writer Hideto "HYDE" Takarai. I am in no way affiliated with Hyde, L`Arc~en~ciel, or their management. All pictures and other media are copyright to their original and respective owners and are used for entertainment only. Hydeist.tk is an unofficial fansite dedicated to the singer and song writer Hideto "HYDE" Takarai. I am in no way affiliated with Hyde, L`Arc~en~ciel, or their management. All pictures and other media are copyright to their original and respective owners and are used for entertainment only. No copyright infringement is intended.